Everyone knows that deer eat mums, so I never plant them in my deer-infested yard. Instead, I plant them in pots on my deck one floor above the ground. I was surprised to discover this newly planted mum completely destroyed. It couldn’t have been eaten by a deer. 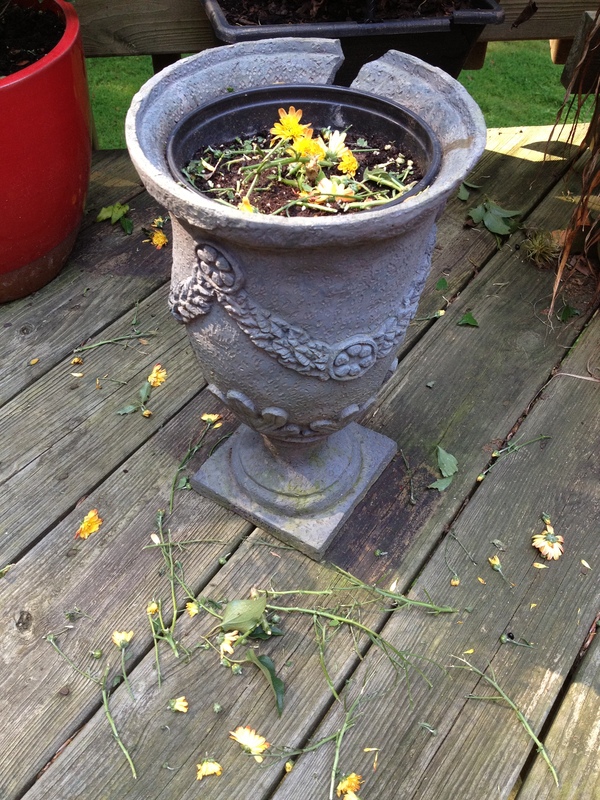 A deer would have had to climb a flight of stairs to get to it and wouldn’t have left all the flower heads strewn about. No, this mum was destroyed by a squirrel. UPDATE: Konabianca, handbagged by her science-loving son, is chastened. Squirrels are not herbivores. They sometimes eat birds; they are omnivores.